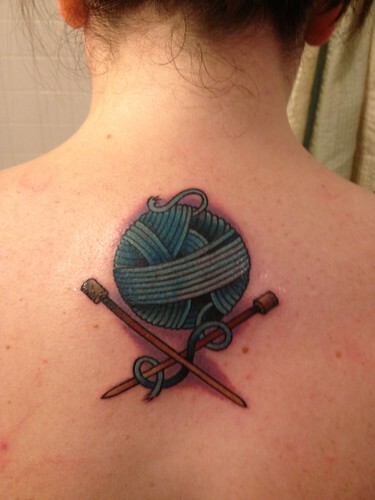 I was on Pinterest today, looking at knitting tattoos as I like to do, and I suddenly remembered that I never showed off my new knitting tattoo to the blog! So, back in October, after almost five years of thinking about it, I went and got my very first tattoo. Knitting related, of course. My friend, Pam, has a son who is a tattoo artist. Pam is a knitter and crocheter, so I thought her son would have at least some idea what a proper yarn ball looks like. :) I think he nailed it. Three months later and there are no regrets with this tattoo. I think I love it more now. Not gonna lie, I have started thinking about a second fiber-related one. It will probably take me another five years to work up the nerve to do it.